Excessive girth swelling and sudden bloating are a particularly prominent issue during times of hormonal imbalance, such as menopause or PMS. Fortunately, simple changes in habits can quickly deflate the problem. 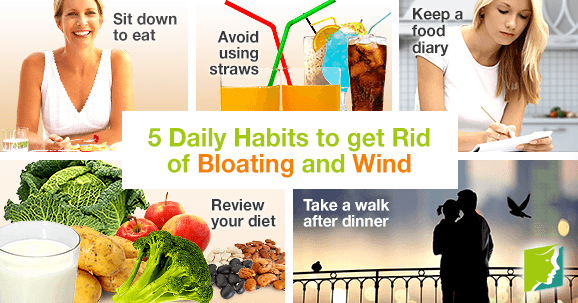 Continue reading to discover five daily habits you can get into to rid yourself of bloating and wind. This is a good way to prevent yourself from swallowing too much air, which can cause bloating and wind. Sitting up straight instead of bending over in a slumped position can also prevent excessive bloating. Talking while eating can also cause excess air to be swallowed. Make a habit to keep track of the foods that cause your stomach to bloat. In particular, watch out for specific processed foods, high in sugar and salt, and may also contain specific additives you could be sensitive to. Other foods that cause bloating and wind include broccoli, potatoes, apples, milk, cabbage, and beans. Although many of these foods a good component of a healthy diet, if they begin to cause significant discomfort, then they should be avoided or substituted whenever possible. Although there are some foods which can trigger bloating and wind in a wide number of people, some foods are particular to individuals. Keep a food diary listing everything you eat day to day, and refer to it when you discover that you are suffering from bloating. Doing this each time you bloat will help you to recognize patterns and show you what is putting you at risk of bloating and wind. Straws are often recommended as a way to prevent the sugar from fizzy drinks from harming your teeth. However, drinking through a straw can cause you to swallow excess air, which in turn causes bloating and wind. In addition, carbonation can cause gas, so cutting soft drinks and straws from your life may be a good plan. Exercise may feel like the last thing you feel like doing right after eating, but even taking a short walk for five minutes can help to release the air that was swallowed during eating and is trapped in your digestive tract. On top of preventing bloating and wind, walking will also help you to burn a few extra calories and improve heart and endocrine function, so it never comes amiss. Continue reading about a weekly plan to stop bloating. Bloating is a common symptom of menopause. However, these simple diet tips can help you diminish it. Click here to learn more.